The Microspectra 121 Film™ microspectrometer is designed for thin film thickness measurement. It incorporates the latest technological advances in optics, spectroscopy and software to deliver the best performance for film thickness measurement capabilities for many devices. It is easy to use yet able to non-destructively measure film thickness of even sub-micron sized features. As such, the Microspectra 121 Film™ represents a giant leap forward in film thickness measurement and UV-visible-NIR microspectroscopy. The Microspectra 121 Film™ microspectrophotometer combines the latest technologies to allow the user to measure thin film thickness of both opaque and transparent samples areas as small as one micron. And all with the same instrument! 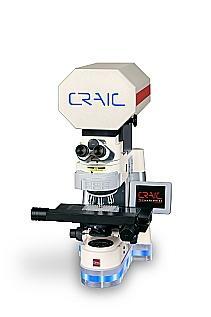 The instrument includes CRAIC Technologies™ thin film software and the option for automation. Additionally, the samples are viewed simultaneously during microspectral data acquisition. This allows the user to visually and spectroscopically locate and analyze their sample. The Microspectra 121 Film™ microspectrophotometer is simple to use, the measurements are non-contact, non-destructive and the spectral data is unmatched. The Microspectra 121 Film™ Microspectrometer can take spectra and images from the deep ultraviolet to near infrared with one seamless operation. It can acquire microspectra and images in absorbance, reflectance, and fluorescence. The microspectrometer is offered with both the DirecVu™ to view samples by eye as well as with a high resolution UV-visible-NIR digital imaging system. Manual and automated configurations are available as are such options as hotstages. The lit blue base and lit hexagonal optical head are both trademarks of CRAIC Technologies, Inc.
Ultraviolet-visible-NIR spectra in one shot... No changing optics! Software including specialized data analysis, databasing and imaging.